As sectarian violence in Lebanon, spillover from Syria continue, Hezbollah-backed candidates vie for the presidential post. Lebanon's parliament convenes Wednesday to try to elect a new president without a clear frontrunner in sight because of deep divisions over the Syrian conflict and Hezbollah's arsenal, according to AFP. The conflict next door in Syria has pushed more than one million refugees into Lebanon and drawn in the powerful Islamist group Hezbollah which is fighting alongside the Syrian regime. The violence has also spilled over into Lebanon, which was dominated by Syria for nearly three decades, in the form of car bombs and armed clashes. The three-year-old war has also raised sectarian tension between Shiite backers of the Iranian-sponsored Hezbollah and its Syrian allies and Sunni supporters of the deadly uprising in Syria. Lebanon has been rocked by a string of political crises since the end of its own 1975-1990 civil war, and it is now divided between two camps and their international backers. The "March 14" bloc, led by Saad Hariri, son of assassinated former premier Rafiq Hariri, is supported by Washington and Riyadh and largely backs Syrian rebels. It is opposed by the "March 8" bloc headed by Hezbollah, which has the backing of both Damascus and Tehran. Discussions inside the blocs have begun, but Fadia Kiwane, political science department head at Beirut's Saint Joseph University, said they are unlikely to yield swift results. "What is almost certain is that a president will not be elected in the first round" of voting, on Wednesday, she told AFP. "No candidate will be able to get two-thirds of the 128 votes" required by the constitution, she added. If no candidate wins two-thirds of the vote in the first round of a secret ballot, a second round has to be held, requiring only a simple majority to be elected head of state. Lebanon's presidents are chosen by parliament, and under the country's delicate multi-confessional system the post is traditionally filled by a Maronite Christian. The current president, Michel Sleiman, leaves office at the end of his six-year mandate on May 25. Since the end of the civil war, the office of president has lost much of its power, including the right to dissolve parliament. But that has not stopped international players from seeking to influence the incumbent. "The issue is regional. Saudi Arabia, Iran and Syria are voting because the next president will set the tone" on issues such as Hezbollah's arsenal, Kiwane added. So far, just one candidate has announced his bid: Samir Geagea, a former warlord and member of the March 14 coalition who is widely seen as having little chance of winning. He is backed by Saad Hariri but "he has no chance of winning the first round" because of his opposition to Hezbollah, said Kiwane. Hezbollah, the Shi'ite terror group which has established a stronghold in Lebanin, rejects Geagea as a "candidate of division" and says it wants a president who "defends the choice of resistance" to Israel. It has defended its powerful arsenal - making it the most powerful military force in the country, over the Lebanese Army - as essential to "protect" Lebanon from the Jewish state. But critics accuse it of seeking to impose its will on Lebanon - through terror and political power. Other potential March 14 candidates include Amin Gemayel, who served as president during the civil war, as well as MPs Boutros Harb and Robert Ghanem. But the bloc's choice is unlikely to prevail, analysts say, with Syria and Iran opposed to any Lebanese president hostile to their interests and anti-Hezbollah. 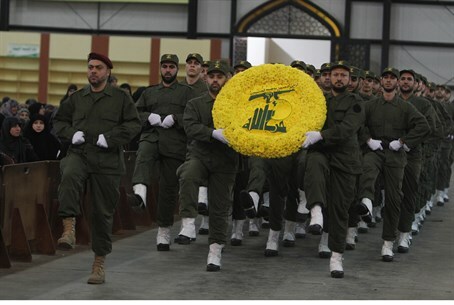 "The balance is tipped towards Hezbollah because, after all, the Syrian regime has managed to stay in place," Kiwane said. And those countries opposed to the Iran-Syria-Hezbollah axis, including the United States and Saudi Arabia, are not in the mood for confrontation, she added. On Hezbollah's side, the most prominent candidates are likely to be Michel Aoun, their firmest Christian ally, or Sleiman Frangieh, who is close to Syria's embattled President Bashar al-Assad. March 14 will reject those candidates, meaning "it is very probable that we will go to candidates who are not yet in the race," Kiwane said. Otherwise, "there is a real risk of a presidential vacuum."